I always wanted to learn to fly fish but was told how difficult it was to become good enough to catch fish. Then someone told me about this gentleman up on the White River in Cotter, Arkansas. Ron McQuay outfitted me for a very reasonable price, set up my St. Croix tackle and patiently showed me how to rig up everything in a very simple way. 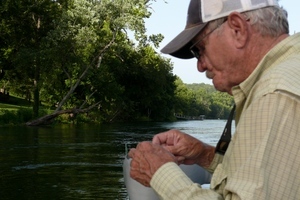 Then we went out to Bull Shoals St. Park where he taught me how to throw the fly. In the beginning it wasn't a very pretty thing to watch but because of his patience and his simplifying the method I had the solid fundamentals I needed quickly. Then we went to the river where he continued his instruction. Matter of fact, I caught fish that first day! It was great! I later introduced my Son and Daughter-in-law to Ron and they also enjoyed his instruction and the easy way in which he explained everything. Anyone interested in learning to fly fish should call Ron. He is really a good teacher and a gentleman as well. 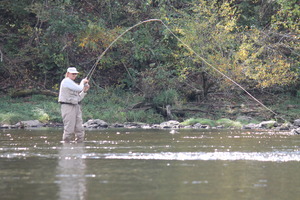 There is only one guy to call when you need a fly fishing lesson….Ron McQuay is that guy! I see it all the time, folks coming in the fly shop, a little uncertain, shyly asking,” how do I learn to fly fish?” I immediately send them Ron’s way. Ron has been teaching people the art of fly fishing for more years than he would like to admit, but that’s what it takes. 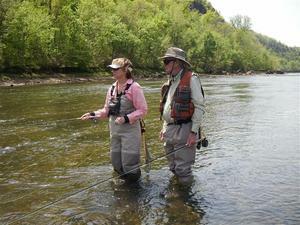 In a day with Ron you can go from a shaky novice to a confident beginner…..Take it from me, if you want to shorten the learning curve and start catching fish on your fly rod, call Ron McQuay! I have had the privilege of knowing Ron for a little over 3 years now and I can't think of another person that I have met during my time in North Arkansas that is more sincere and geniune than he has been to me,my family and those that are around him. Above being an incredible fly tier, fly fishing angler and an extremely knowledgeable instructor, Ron is patient and willing to go above and beyond the call of duty to make sure that his guests haven't only learned more about fly fishing during their time with him but that they have enjoyed there day with him by the time it is all said and done. 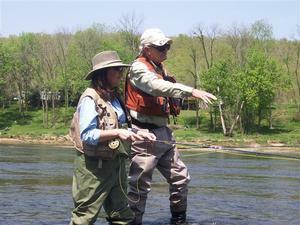 There isn't anyone better that I know that I would recommend for a day learning the basics of fly fishing. Ron does this day in and day out and aside from giving you all of his tips and tricks, he is just there to give someone else the pleasure of learning a sport that is so dear to him. 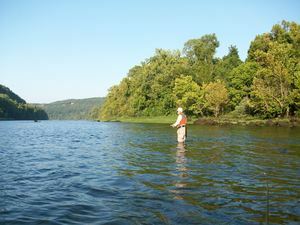 Ron's passion for fly fishing runs deeply and quietly through his soul. You can feel his love for the sport as he takes you through the different steps of his class. You'll learn the necessary knots to put your outfit together and tie on a fly. You'll be amazed at his patience as you learn to cast. When you struggle to achieve a perfect dead drift, Ron whispers words of encouragement nearby. You will not go wrong hiring this man to introduce you to fly fishing. His class time is threaded with subtle humor. There is no shouting, no admonitions. You'll part company confident that you can stand in a river without embarrassment. I've been a fly fishing guide on the White River for five years plus in Alaska for two years. I've had the privilege of working with Mr. Ron McQuay at Mountain River Fly Shop for a couple of years. Mr. Ron played a big part in my fly fishing career. With his knowledge of fly fishing, fly tying, line set-up, casting, and his willingness to share all of this knowledge, set me on the road to being the fly fisherman that I am today. I've had the opportunity of assisting Mr. Ron in some of his fly fishing classes, seen first hand the patience he has with beginners and his love for teaching. I highly recommend one of Mr. Ron's classes, if you too want to become a fly fisherman or have interest in tying flies. 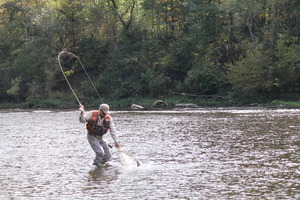 I began fly fishing four years ago after taking a lesson from Ron McQuay. The instructions were very clear and Ron has to be the most patient man I have ever met. Not only will he teach you the basics of fly fishing, you will have a friend for life! I have had the opportunity to fish with Ron at least once or twice each year and he continues to be a great mentor to me. Thanks for all the instructions, the great times, and for being my friend Ron!